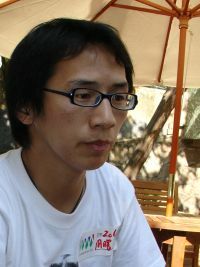 Blogger Zhou Shuguang (周曙光) a.k.a. Zuola or Zola, who some days ago was barred from going to Germany by the chinese authorities, has also been one of the more conspicuous participants at this year’s chinese blogger conference CNBloggerCon, two weeks ago in Guangzhou. In front of the entrance to the conference venue, Zuola sold t-shirts showing his picture, most of the time you could see him networking eagerly, distributing his name cards, advertising his talk. 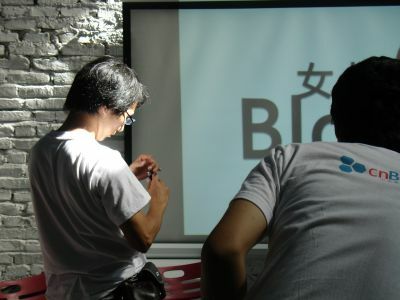 People knowing his reputation as one of China’s most famous citizen journalists could easily see that there was a subtle re-branding going on. Zuola.com (his Skype handle) is still promoting himself as an advocate of those common people who are neglected by the mainstream media. But he doesn’t want to be seen any more as ‘blogger on demand’, who can be called to help and publish the suppressed truth. He is now a “Network Engineer”, says his namecard, and many participants misunderstood the announcement of his talk, thinking he would talk about technical topics like GFW evasion. In fact Zuola was giving a lecture on how to become a citizen journalist. His newly declared aim is the empowerment of the chinese people to self-publish their concerns. This is not exactly on the same line of business as the events that made him famous, like his live reporting from Chongqing when a family resisted the tearing down of their house (the famous “nail house” case), his reports about the protest against the construction of a chemical plant in Xiamen, about the ant-farmers’ situation in Shenyang, or his cooperation with other bloggers to investigate dubious “black jails” in Beijing after the Olympics. It is difficult to say what is the motivation behind this shift. Maybe it’s the fact that he had got detained and mistreated after the Shenyang story, maybe it’s because people have been criticizing him for taking money to write about ordinary people’s worries and for other sins, that he is now looking for a less risky and more transparent business model. I plan to give technical support, help more people to use the Internet. Currently, I would like to support journalists and lawyers, to help them learn how to write blogs and how to make use of Internet technology. It’s because I’m more efficient than them. But they can improve their efficiency through learning these technical means. No more citizen journalist’s work? I prefer to do technical support rather than reporting news myself, because I lack some of the necessary professional skills for news reporting. But I think the professionals and I can complement each other. Cannot bloggers give ordinary people a voice and an audience? They can. But in the near future it will be more about educating ordinary people and raising the level of literacy and technical knowledge. Also, bloggers still have to get help from the traditional media if they want to bring events to the attention of a wider audience. But if we use blogs, for example, to educate people like ordinary citizens or policemen about legal matters, the quality of the whole society will be improved. Both sides are still rather ignorant about these matters. We have to teach people how to use blogs for their concerns. Some people have already learned to do this. When I helped the Nail House people in Chongqing, the events got the attention of the traditional media. If such is the case, these people will consider their attempt to be a success. Could this kind of support become a business model for bloggers? Yes, and a very good one too. The moment this becomes a business, there will be competition and the model can develop. Only when it becomes a working business model, the social problems can be solved. Right now it has not yet started. I’m the only one doing this kind of support, and I do it not for money but out of pity. But I do want to make this a trustworthy business. How about the risks involved? You might run into powerful opponents. Also you could lose your objectivity if you make yourself the advocate of certain people. Where is the risk? It will not be me who speaks, it will be them. If I did it, there would be a problem. But that is not what I intend. They articulate their position, so objectivity is not an issue. Maybe through an NGO, maybe through a commercial organization, I don’t know yet. I definitely need help and financial support. If you want to do it in a professional way, there has to be teamwork, there has to be some kind organization. Alone I would not succeed. I’m a bit disappointed that he won’t mention the “blogging on demand” issue. It would be interesting to hear a passionate case made for it in a Chinese context, which would rather overturn much of the conventional wisdom on the ethics of blogging. That’s exactly what I thought. Fairness demands to say that the interview situation was a bit difficult. We had little time, he was preparing for his talk, and all questions had to be translated. So he may have misunderstood my intention. But I was much more explicit than in the short version of the questions I quote above. I think he was simply not willing to go into that topic, which I think is immensely interesting on its own.